Casinos can be a daunting environment for even the most skilful gamblers, but even more so when you are experiencing it all for the first time.Not only are there a multitude of games, many of which can be confusing to learn, but many new players may also find the dealers and other players seem to be speaking an entirely different language. Indeed, casino jargon can be hard to get your head around at first, however once you have a basic understanding, the words will soon be rolling off your tongue. To help players who are new to the world of casinos, we have devised a list of the common terms you will hear within the casino walls to make your first time a little bit less scary. Action: The amount of cash wagered (i.e. put into action) by a player during an entire session. All-in: Commonly used when playing poker, this means you are wagering all of your money on a single bet. Ante: A term for the mandatory bet required from all players of a game before any cards are dealt or viewed. The ante ensures there is money in the pot and is used to force action by other players, therefore keeping the game moving. Without the presence of the anti, players would not be forced to bet, meaning that hands could be played where no money is won or lost – defeating the purpose of playing the game. Bankroll: This refers to the amount of money you are willing to gamble with when entering a casino (or playing online). Betting limit: Pretty self-explanatory. On a table game, the betting limit refers to the minimum and maximum amounts of money which can be wagered by a player on a single bet. Blind bet: When a player makes a wager without knowing what card will come up next. Buy-in: The process of converting your money into casino chips in order to play at a table game such as Roulette, Blackjack etc. Capping: This will see you get kicked out. Essentially, capping is placing additional chips on top of an existing bet after the deal has already begun. Colour up: The process of exchanging smaller denomination chips for those of a larger denomination. 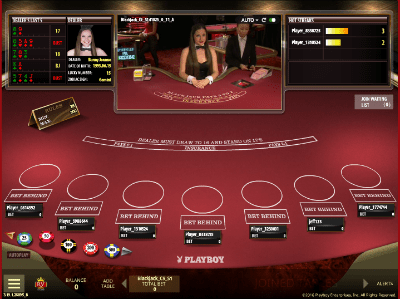 This is the online version of a croupier, seen here at Royal Vegas Online Casino. Croupier: Another word for dealer. Double down: A term used in Blackjack for a betting option when the player’s initial two-card hand is turned face-up and the player’s wager is doubled. The player is then dealt one additional card to complete their hand. If this hand then beats the dealer’s hand, the player wins twice the amount of their original wager, while they lose twice the amount of their original wager if the hand loses. Double or nothing An even-money bet which pays off exactly the amount wagered. Eye in the sky: Nicknames for surveillance cameras which are normally above the gaming area to monitor activity. Face card: Name for the King, Queen and Jack cards of any suit. Fish: An affectionate term for someone who is new to the world of gambling. Flat top: A poker machine which has a fixed jackpot in comparison to a progressive jackpot which accumulates until it goes off. High-roller: Someone who wagers massive bets. Hit Me: No, this isn’t a request. This term is used in Blackjack by the player when indicating to the dealer that they want another card. Hot: Used to describe someone who is on a winning streak, or a poker machine which is paying out. House edge: The built-in advantage developed by the casino which results in many games paying less that the actual odds of winning. Martingale: A betting system based on doubling your wager after each loss. Natural: In Blackjack, a natural refers to a two-card hand which equals 21 points, whilst in Baccarat it refers to a two-card hand totalling eight or nine. Overlay: Means that the gambling situation is favouring the player. Pot: Used in poker, means the amount of money which accumulates in the centre of the table as each player antes, bets and raises. The pot goes to the winner of each hand. Push: A tie between the dealer and the player. Scared money: Cash which you can’t afford to lose. Shill: A person who plays table games on behalf of the house in order to fill empty seats. Shoe: A device which holds and dispenses playing cards to be dealt. Tell: A player’s body language and expressions which may give away the value of their hand. Toke: This is slang for tipping the dealer which is customary in larger casinos, especially when you have landed a big win. Underlay: An unfavourable bet or a result which has more money bet on its occurrence than can be justified by the probability of it happening. Upcard: The face-up card belonging to the dealer’s initial hand in Blackjack. Whole card: A card which is dealt face down and belongs to the dealer. Still don’t understand the casino jargon? Never fear, there is another option for players who want to experience the fun and excitement of playing at a casino without the hassle of understanding what everyone is shouting around you. Online casinos are growing by the day and now more than ever there is an abundance of websites offering a wide variety of casino games both for free and real-money play, right from the comfort of your own home. Only choose a reputable online casino which offers a safe betting environment and a generous welcome bonus upon sign-up. Additionally, online casinos can be played on your computer, mobile phone or tablet straight through your web browser, with no need to download any programs or apps onto your device. The above information is for international readers only – Australians cannot legally online card games for real money as of September 2017.